Feels like I’m dreaming but I’m not sleeping. My mom introduced me to Thai cuisine at a young age. She and I frequented a local family-owned Thai restaurant almost monthly. We’d always order the Tom Yum Soup and Pad See-Ew dishes. Those were our favorites. We’d crave them all the time, discussing the delightful sourness of the soup and the tender bites of Chinese broccoli in the noodle dish. We became such regulars that the owners of the restaurant had already placed our orders by the time we sat down and got our drinks (I always had Thai Iced Tea with my meal). 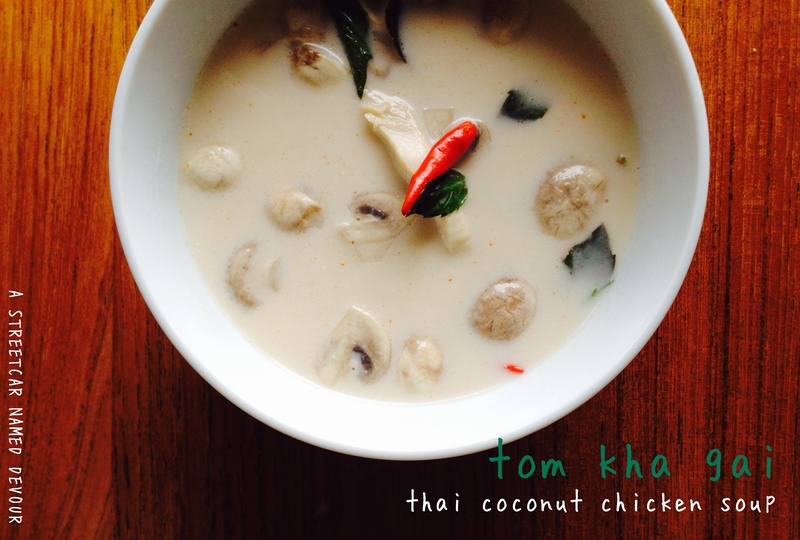 My first obsession was Tom Yum soup, then came my meeting with Tom Kha Gai. 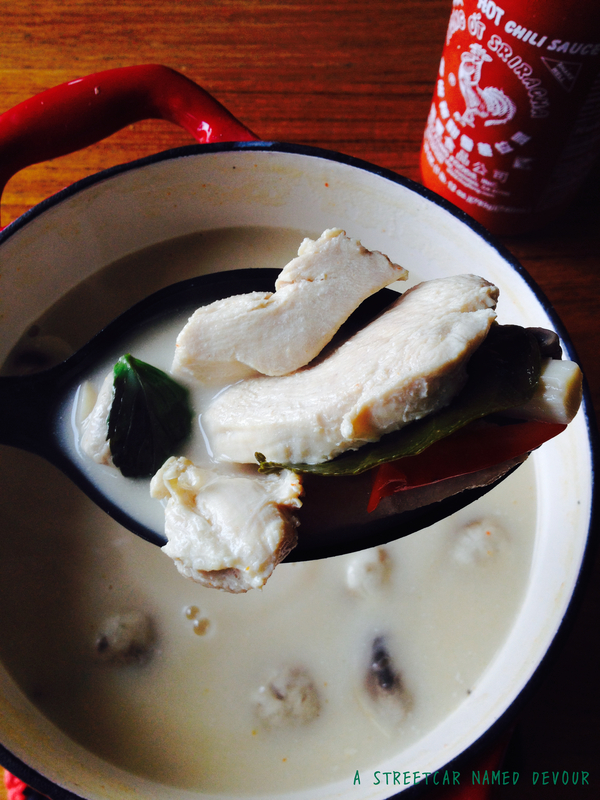 In Thai, the dish literally translates to Spicy Galangal Chicken Soup (Tom = Spicy Soup, Kha = Galangal, Gai = Chicken). Thai cuisine reminds me so much of my mom, so I crave this food when I’m missing my family most. 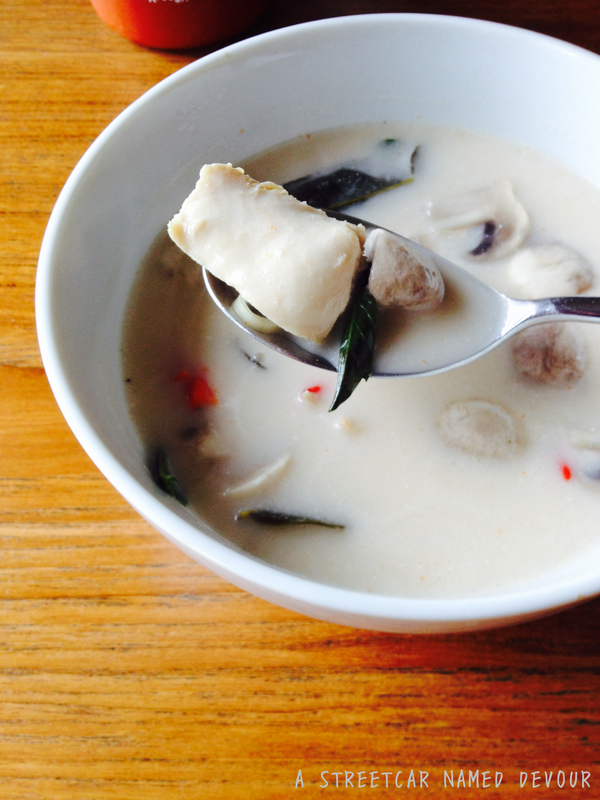 I’ve tried Tom Kha Gai soup in almost every Thai restaurant I’ve visited, but this recipe (with my own personal tweaks) is the closest to the authentic Thai flavors I grew up tasting. *Cook’s note: Galangal is a rhizome related to ginger, although it has a tougher skin that’s lighter in color. It also has a distinct peppery flavor much different than ginger’s. Kaffir limes are native to the Southeast Asian countries and have astringent qualities. Their leaves carry a lovely and distinct aroma. Galangal and kaffir leaves may be difficult to find, depending on where you live. Check out your nearest Asian markets for these speciality items. 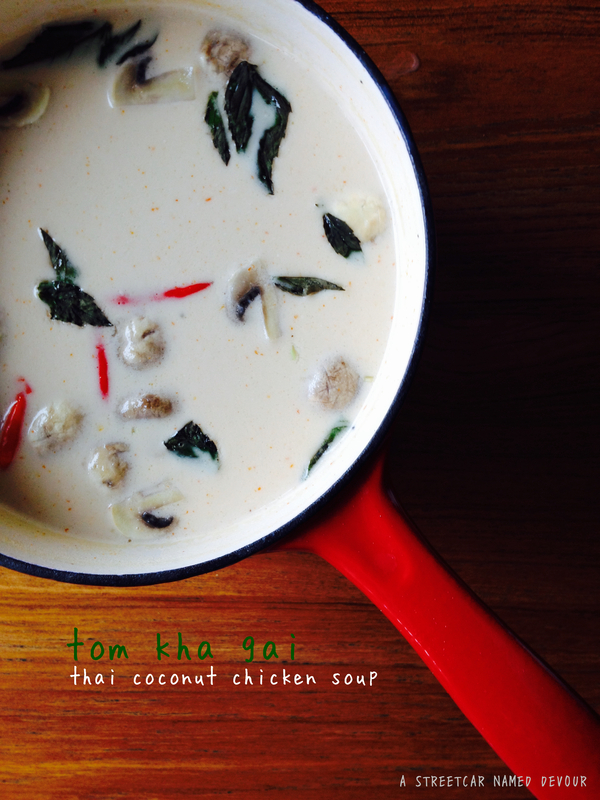 In a large saucepan, bring the lemongrass, galangal, kaffir lime leaves, Thai bird chiles and broth to a boil. Reduce the heat and simmer until flavors are well pronounced, about 30-45 minutes. Strain the broth into clean saucepan; discard the galangal, but keep half the amount of chiles and half of the lemongrass. Add the chicken and return to a boil. Reduce the heat to a simmer and add the mushrooms, skimming occasionally until the chicken is cooked through and mushrooms are softened, about 20–25 minutes. 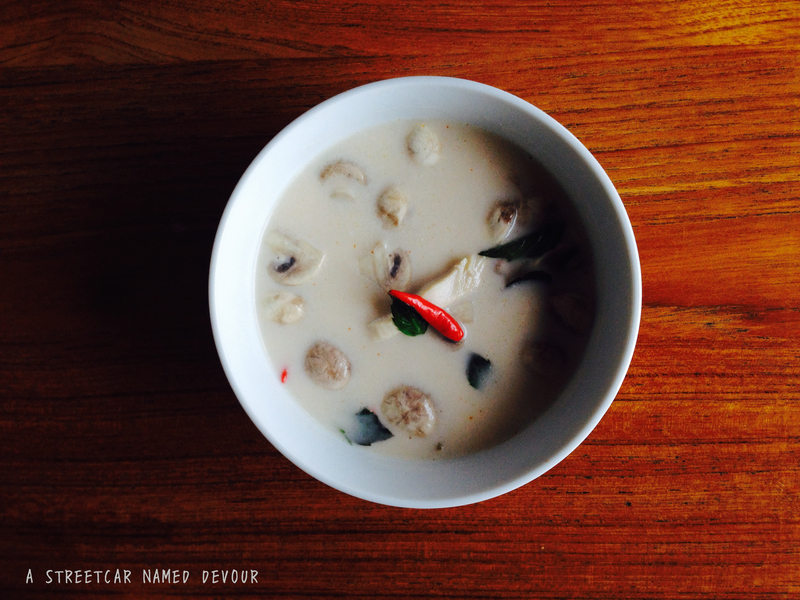 Mix in the coconut milk, fish sauce, sugar and fresh herbs. Season with salt, pepper and hot sauce. girl this looks so good! 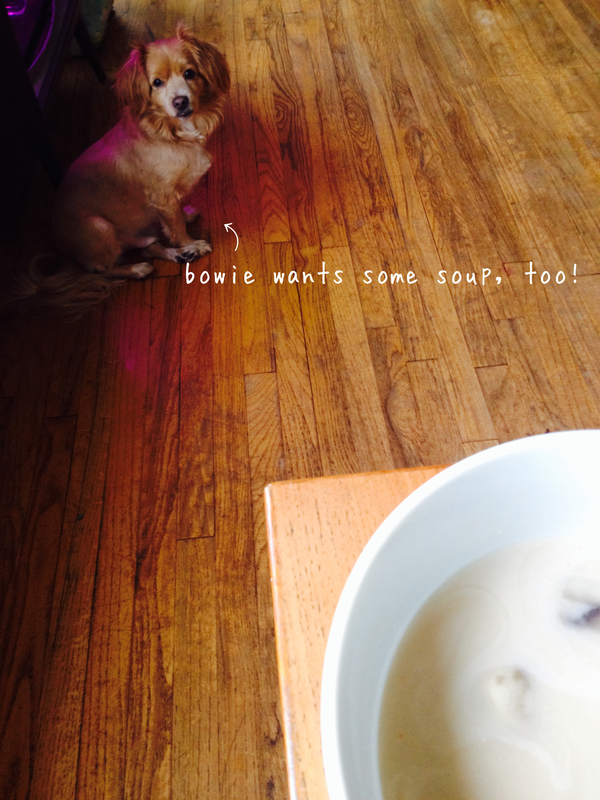 And I love that Bowie made an appearance! Yum. I want this every day. Forever. The end.